Well, tomorrow is January 31st. January 31st has for several years been the deadline for submission of tax returns. That means that over Christmas, I am to be found with a head buried in mounds of paperwork. This year, there were several last-minute corrections to be made when errors were discovered – it appeared at first that I had made 6 times as much money as I have made – I couldn’t remember spending it – but finally we got there. Several cups of coffee were needed, plenty of head-scratching – but we got there. This year 31st January is also the day that we close for the annual shutdown. Up until this year, we closed on 7th January and reopened on 1st March – but we were successful in a planning appeal which means we now can open 50 weeks a year – instead of 44 – so we have just 2 weeks to get all the close-down work done. If you’ve read this blog at the same time in previous years, you can be forgiven for believing that we are facing an impossible task – but last year we achieved the last of the major jobs, so we have a lot less to do. Next week it is the annual conference of my trade association from Tuesday to Thursday. On Tuesday evening there is a photo-opportunity with David Bellamy, and because I have recently been awarded a Gold Award for conservation, I will be having my photo taken with the great man. He was a hero in my childhood, often appearing on shows like Blue Peter, and to get an award from your hero is really great. On Thursday two display caravans are being taken off the Caravan Park – a symptom of the credit crunch – our suppliers cannot afford to fund as much display stock as in previous years. For the last few years, we have started with 3-4 new caravans as display units, and we have sold them all during the course of the season. Last year we started with 5 new caravans – and only sold one. At least we don’t lose every display unit… but new caravan sales are definitely way down on previous years. We start 2009 with 5 caravans dedicated as rental units – something we have never done before. However, we have gone into a marketing partnership with Hoseasons, a major self-catering agency, and bookings are already flooding in. We will not make any profit this year, even if we are fully booked – as we have invested about £40,000 in these rental units – but there should be profit there in future years, once we have repaid the initial capital investment. It’s just something we have to do – change our business focus – in order to survive the economic downturn. Coincidence – just as I was typing this the fax machine rang – confirmation of anothe booking! 2009 may well be a challenging year – 2008 was – but we will survive. I watched this live on American TV, with my heart in my mouth. I thought at the time that the Pilot was no ordinary Pilot…. some experience in Light Aircraft had to be there to carry out a “seat of the pants” manouevre, and to have the first reaction “let’s get down safely” rather than the airline captain mindset of “let’s troubleshoot – where’s the checklist”. Turns out he is a “Top Gun” graduate…. former F4 fighter pilot… and a glider pilot. All skills that he could call on in an instant – skills that saved a lot of lives. 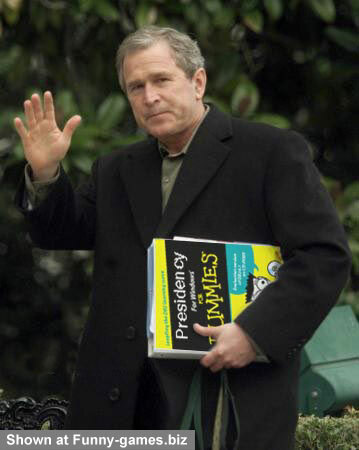 As George W Bush retires, it is truly the end of an era. Let’s take a moment to review some of his words of wisdom. An American boards an intercity train in London to travel up to Scotland. The train is very full and he wanders up and down the tain looking for a seat. Eventually he finds a seat next to an old lady occupied by a miniature poodle. The American has had enough. He picks up Fifi, opens a window and throws the dog out of the train.